Another essential part of traditional Chinese medicine is moxibustion which involves the burning of a small, spongy herb called mugwort. This technique facilitates healing by stimulating the flow of qi, strengthening the blood and maintaining overall health.Moxibustion has been used throughout Asia for thousands of years; in fact, the Chinese character for acupuncture, when translated, literally means “acupuncture-moxibustion”. Mugwort, also known as ai ye in Chinese or artemesia vulgaris has a long history of use in ancient Chinese. Several studies have shown that this herb increases blood and qi circulation that is why it is commonly used for cold and stagnant conditions. There are two types of moxibustion, direct and indirect. Indirect moxibustion is currently the more popular and commonly used because there is much lower risk of pain or burning. 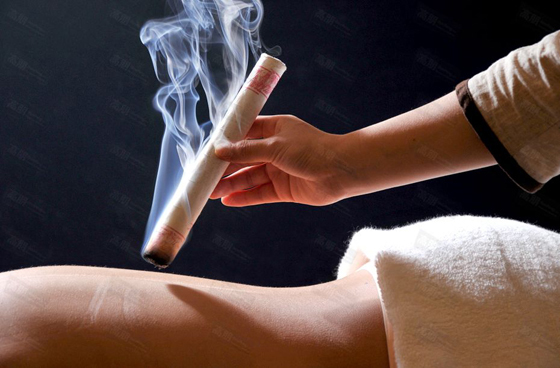 In indirect moxibustion, the practitioner lights one end of the moxa stick and holds it near the area being treated for several minutes. Another way is using both acupuncture needles and moxa wherein a needle is inserted at an acupoint and the tip of the needle is then wrapped in moxa and ignited creating heat to the point and the surrounding area. After the desired effect is achieved, the moxa is removed and the needle/s is/are disposed. Direct moxibustion is rarely used. Here, a small, cone-shaped amount of moxa is placed on top of an acupoint and burned. This is further categorized into two types, scarring and non scarring. With scarring moxibustion, the moxa is placed on a point, ignited and allow to sit onto that point until it burns out completely. This can result in localized blisters, scarring, and scarring after healing. With the non scarring type, same procedure is being done but moxa is removed before it burns the skin. Patient usually experienced a pleasant healing sensation and should not experience any pain, scarring or blistering unless the moxa is left in place for too long.